So you might have seen last months Sprinkle Sneakers DIY and wondered how on earth we would ever top it? Well my friends, today we are back with another DIY that is sure to get your footwear ready for the summer! Can you believe these sneakers only cost us £5!! #summerbargain. 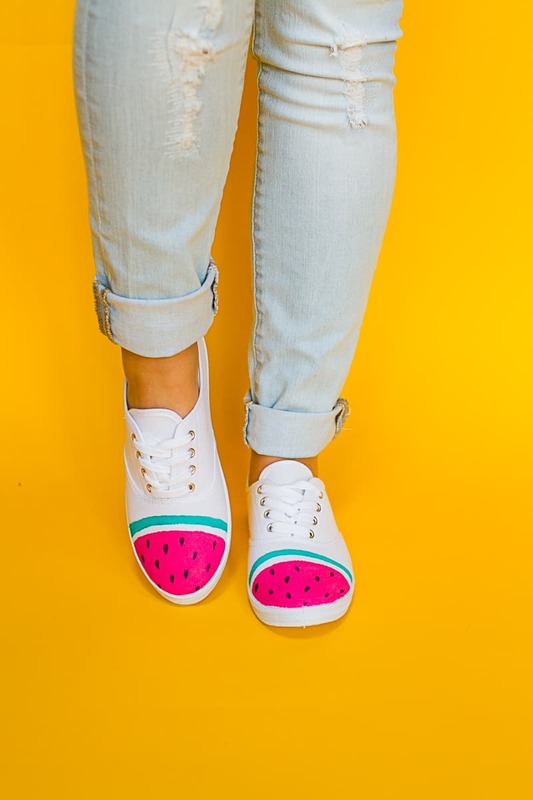 Take your green fabric paint and paint a half moon shape about three quarters of the way up the front of your sneakers. You will want to make the line fairly thick as this will be skin of your watermelon. Leaving a fine gap between the green and pink colours, continue to paint the front half of the sneakers pink and leave to dry. Using a black sharpie draw on your pips. And that really is all there is too it folks! Easy or what! Both myself and Jess keep seeing all these amazing ideas for jazzing up sneakers now, I think it might actually become our new obsession! These are so on point for this summer, I expect to see loads of sporting them on Instagram.